Cedar Hill Fire District recently purchased and placed in service two new brush truck/quick response units. They are 2018, 4×4, Ford F-550 chassis, with V10 motors, and extended cabs, built by CET Manufacturing and purchased through Banner Fire Equipment in Roxana, Illinois. They have a 300 gallon water tank with a 10 gallon foam cell, Scotty around the pump foam system and a 275 gpm pump. They have 200’ booster reels with 3/4” hose and a 150’ pre-connect with 1-3/4” hose. They have a Code 3 lighting package. 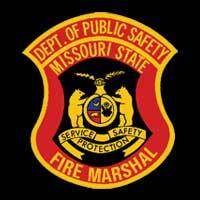 Truck #7718 is located at Station 1 at 6766 Cedar Hill Road, Cedar Hill, Missouri, and truck #7728 is located at Station 2, 8800 State Route 30, Dittmer, Missouri. These trucks will be used for brush fires, running EMS calls and areas with limited access. The 2017 4×4 Ford F-550 chassis that was at Station 2 has now been moved to Station 3 as truck #7738. 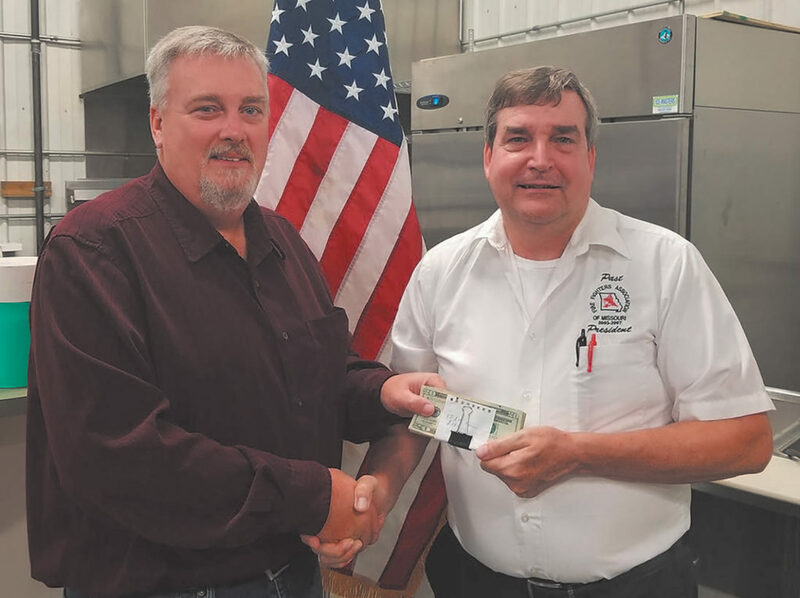 Billy Smith presents Keith Smith with a donation from the State Fair Fire Department for the Memorial Foundation. 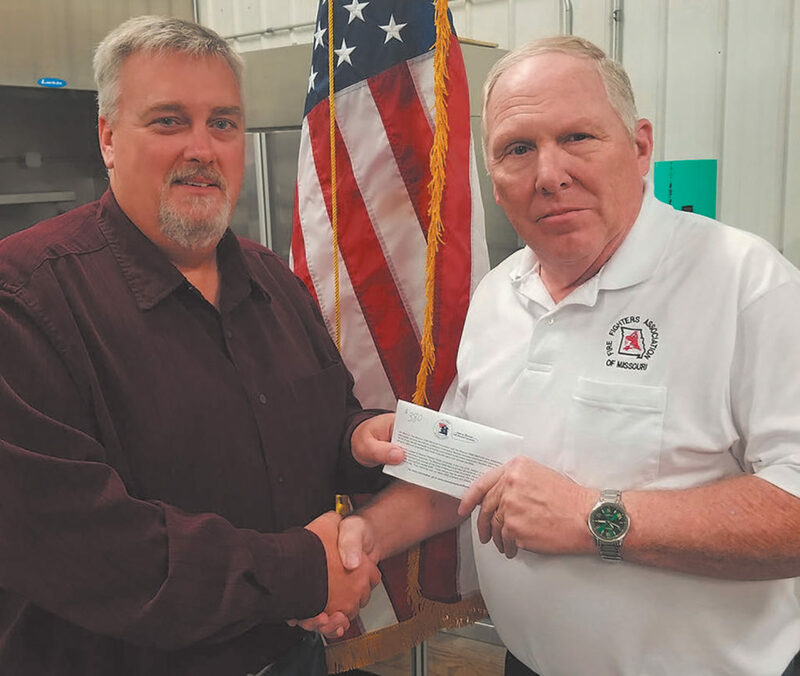 Billy Smith presents Greg Wright with a donation from the State Fair Fire Department for the EMS Funeral Team. Greetings… Wow, where has the year gone! It is already November and before we know it Christmas and the New Year will be here. 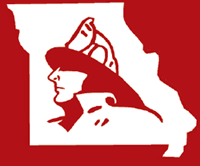 The FFAM board and its committees are continuing to represent the Missouri fire service not only in Missouri but also at the national services in Colorado Springs, CO, and Emmitsburg, MD. 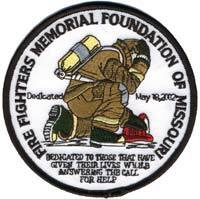 Some of our board members have also been representing the FFAM as members of the Missouri Fire Service Funeral Assistance Team with the LODD in El Dorado Springs, Missouri. As you can see the board is working for you, the membership. Speaking of membership, the membership packets for renewal are due to be mailed at any moment, so be looking in your mailbox for this packet. August 10, 1821: Missouri was admitted to the union as the 24th state. From 1821 through 1826 legislators met in St. Louis hotels and in a temporary Capitol building in St. Charles. During 1821 an expedition began a search for a new Capitol city. December 1, 1821: The Missouri legislature selected a site for new Capitol, located on the Missouri River in central Missouri, The new site was halfway between St. Louis and Kansas City by riverboat. During January 1822 the name Jefferson City was chosen by the legislature. The third United States President, Thomas Jefferson had a vision of westward expansion of the United States borders, Jefferson City was named in his honor. November 1825: Jefferson City was incorporated and by 1826 there was a general store, a hotel and a tavern, thirty- one families lived in the new capitol city. A new capitol building was constructed on the end of Jefferson St. two hundred feet from the Missouri River. Twenty-five years and counting! The 25th Annual Jeffco Fire Engine Rally was held on Saturday, September 29, at the Herculaneum City Park in Herculaneum, Missouri. The annual event is sponsored by the Jefferson County Firefighters Association. The fall weather was absolutely gorgeous and the event attracted firefighters, children and festival-goers from across the region. As in the past, this year’s rally kicked off with a parade of sixty-plus emergency vehicles traveling from Crystal City to the city park in Herculaneum where the apparatus remained on static display throughout the day. Also on display during the rally were rescue helicopters from ARCH Air Methods, Survival Flight and Air-EVAC. 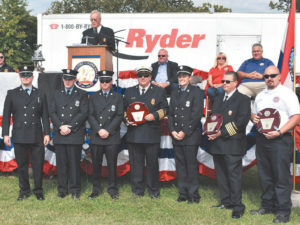 Immediately following the parade, the Grand Marshals were led into the rally grounds accompanied by bagpiper Ian Ebrecht and the Jefferson County Firefighter Association Color Guard to begin the opening ceremony. Wow! What a busy couple months we’ve had with fall open houses by numerous department to getting up for fire prevention week, trainings, and memorials. I would like to thank the Cosby-Helena Fire District for the invitation to come train with them on auto extrication and also Sentinal Fire Equipment for bringing all the E-tools up to use. I met a great group of people that train to make themselves better everyday to provide the best they can for their community. 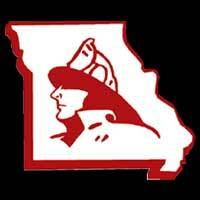 I’ve been impressed with all the social media post of the excellent work for fire prevention the month of October from both volunteer, combination and career departments and applaud everyone for their commitment of involvement within their districts. On a more solemn note, I had the opportunity to attend the IAFF Fallen Memorial located in Colorado Springs, CO. I invite anyone who has the chance to see the beautiful granite walls and the serenity feel of the memorial, whether you’re an IAFF member or not it’s a truly humbling experience and grateful for IAFF Local 5 doing an excellent job hosting the memorial. If you can make a ceremony or the candlelight vigil, that is an experience within itself. As a bonus there is so much to do around town. There is something for everyone, especially an eatery with great people and great food called N3 Taphouse, a retired fire house that was kept as original as possible during the make over. It’s that time again folks! Time to renew your department and its members for the 2019 year. For any questions please reach out to your FFAM representative and we’ll gladly assist you in any way we can and spread the word to neighboring mutual aid departments. This also includes EMS and Dispatching entities. 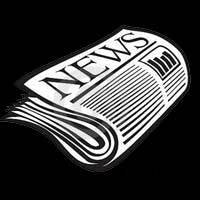 Please have them get in contact with us so we can explain benefits and perks. Word of mouth can help us along the way especially with un-staffed stations so the FFAM representative can set up a time to meet with them. Director Emeritus Hedrick (center) is presented HLLL Induction Certificate by NFHC President Ron Coleman (left) and Vice President Billy Shelton (right) at a formal ceremony in Emmitsburg, MD. 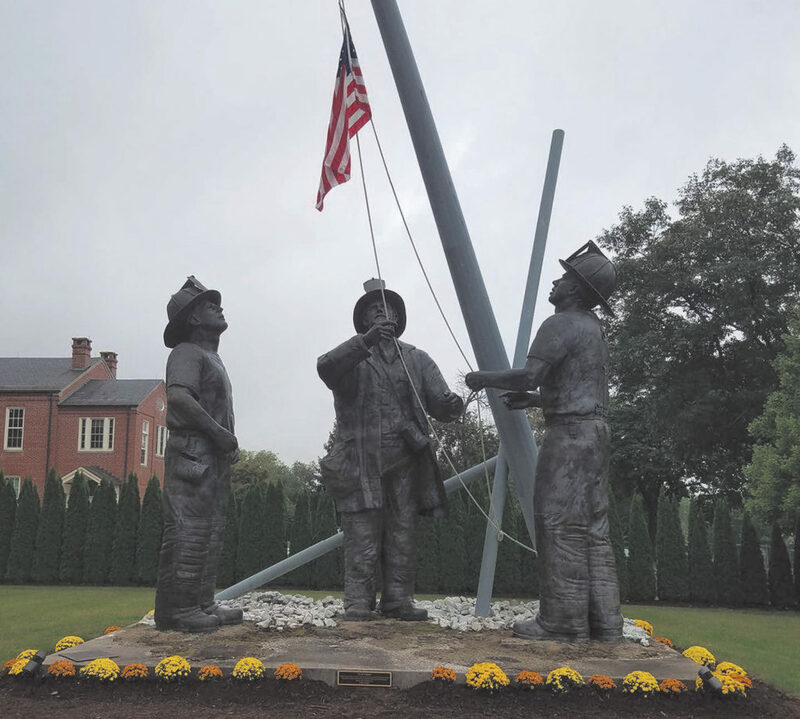 On October 8, 2018, the National Fire Heritage Center (NFHC) in Emmitsburg, Maryland, conducted a formal ceremony for this year’s Inductees into the Hall of Legends, Legacies, and Leaders (HLLL) Class of 2018. The ceremony was held during the NFHC’s Annual Board of Directors meeting. 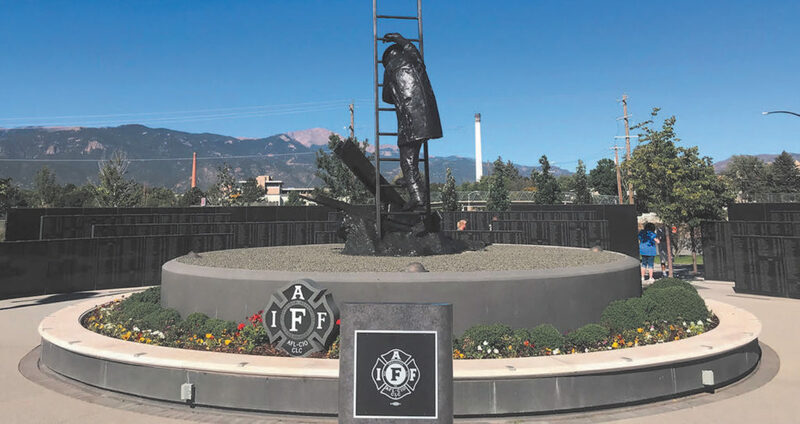 More than a dozen nationally prominent fire community leaders, past and present, were inducted bringing the total number of Inductees to sixty-five since the inception of the initiative. Hedrick commented on the work of the NFHC saying, “I am a firm believer that we must preserve and honor our past to ensure the future of the fire service and its mission. This is why I believe the work of the National Fire Heritage Center is so important.” Regarding being chosen as one of the fire service professionals being recognized in 2018, Hedrick said, “I am greatly honored and yet humbled to be among these highly distinguished fire service professionals which are being recognized. 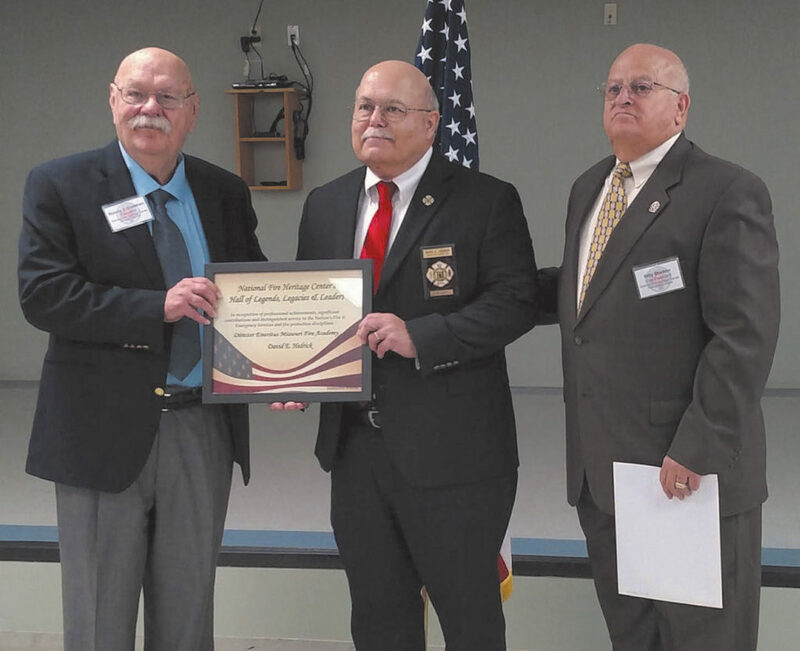 I owe my accomplishments to the many mentors, leaders, and the fire service professionals that have been there for me throughout my fire service career.” Director Hedrick received induction certificate #56 upon being inducted into the NFHC’s HLLL. Well believe it or not, just as expected the winter months have begun, daylight savings time has wound down, busy schedules have not slowed and we are headed in to the traditional “holiday” season. I hope each of you are well and will have the opportunity over the coming months to enjoy much needed rest and interaction with family and friends. I believe we should talk about motivation this time. For a large share of people this is a word or concept that just happens with little to no effort. For others, motivation can be a challenge. For some people they have been highly motivated, but now find themselves… Let’s just say, less than motivated. 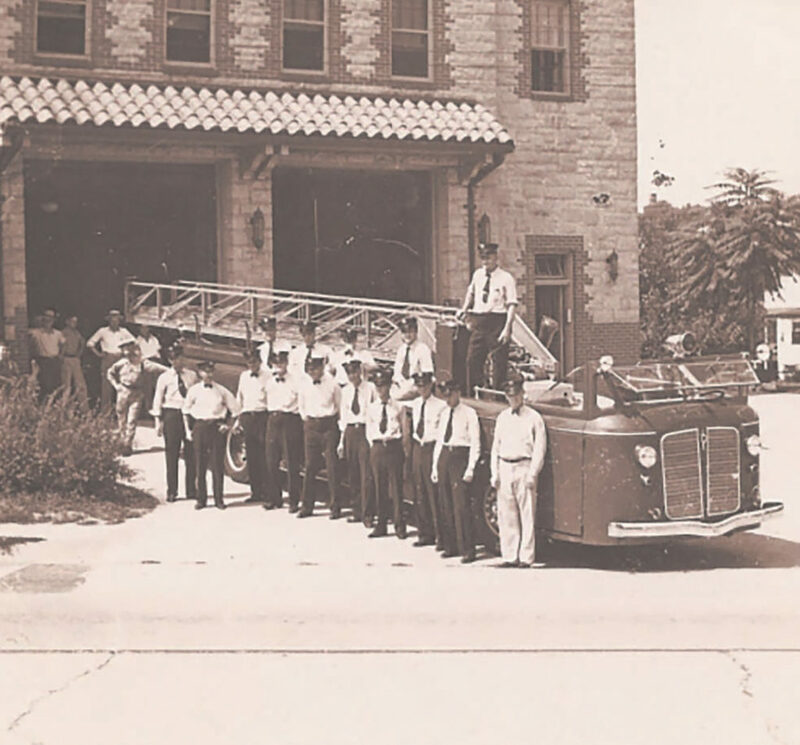 I would imagine if you think back to your early days in the fire service you were highly motivated. It was exciting, it was new, it was a challenge, and you wanted to learn. For some, that remains the spirit right up to an into their retirement years. The rest fall someplace between the highly motivated and the person who leaves the fire service entirely. Perhaps we should examine why over time some of our members are no longer very motivated to put out their best effort, show up for incidents or trainings or even stay a member. I firmly believe that motivation is one of the key drivers in keeping a person actively involved in the fire service. It is incumbent on each of us and particularly on the formal leaders in the fire service to make the fire service worthwhile and to spark the motivation every member had at one time.